Comfort food. I think many of us would say that we LOVE comfort food. According to Wikipedia, “comfort food is traditionally eaten food which often provides a nostalgic or sentimental feeling to the person eating it, frequently with a high carbohydrate level and simple preparation.” That sounds about right. Mac and cheese. Cheesy potatoes. Meatloaf. Soup and grilled cheese. Casseroles. Nom nom nom… I swear, I am going to gain a million pounds just writing about food! 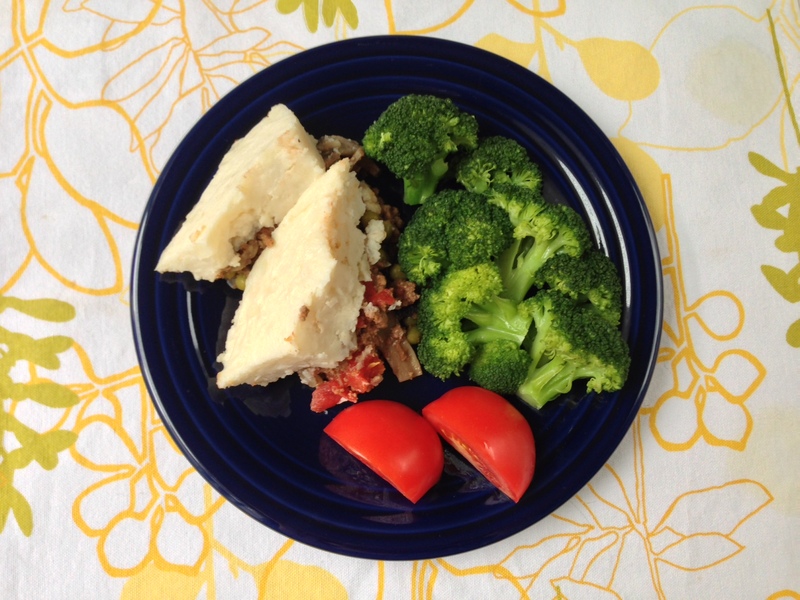 This week, I would like to share one of my favorite comfort foods: Shepherd’s Pie. I orginally found this recipe on myrecipes.com a few years ago and have since made a number of changes to better suit my tastes. 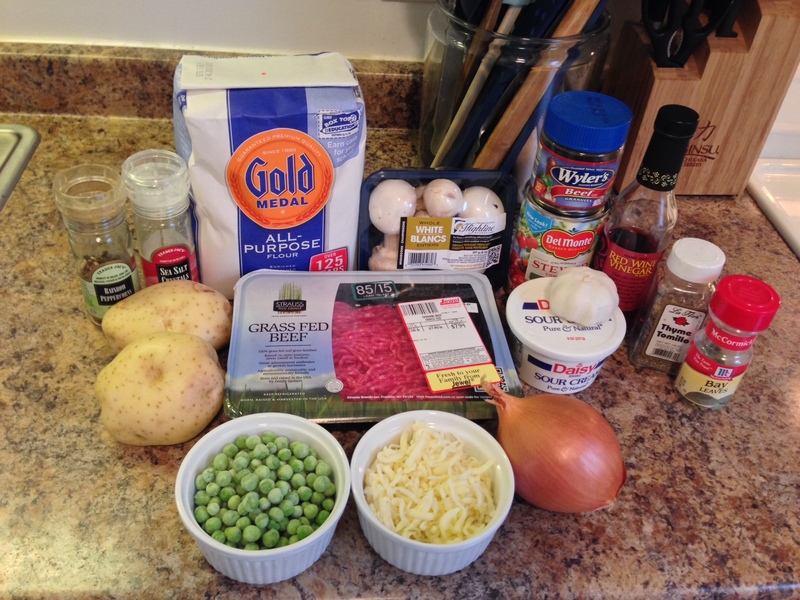 I use a leaner ground beef, add more garlic, and have put my own twist on the potato topping. Being able to make slight changes to a recipe is one of the things that I enjoy the most about cooking. But as I’ve mentioned in past posts, this is probably also why I am such a horrible baker! 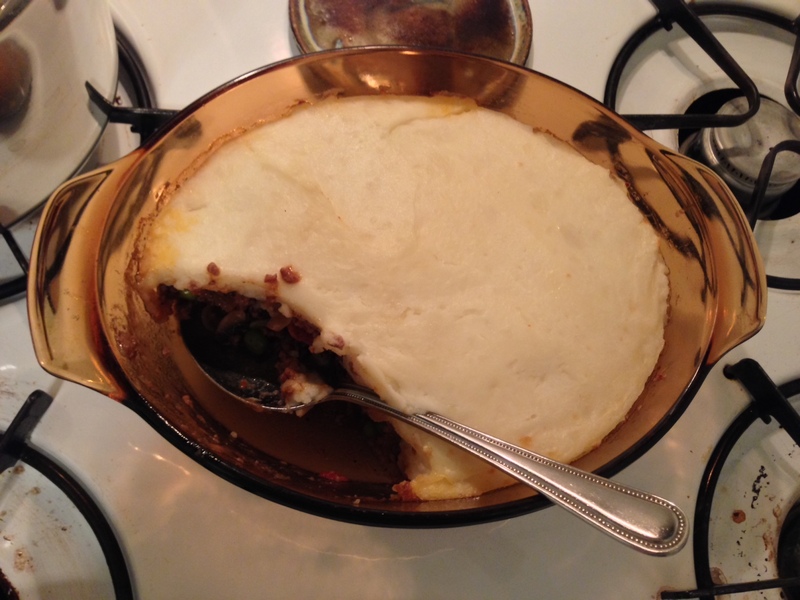 Back to the Shepherd’s Pie… Let’s get started by preheating your oven to 400 degrees. Next, peel your potatoes, cut them into cubes and place them in a large sauce pan with water to boil over high heat. Use your favorite potato – russet, white, red, yellow or blue. You can even leave the skin on if you would like. Potatoes come in all different shapes and sizes but I recommend 3- 4 large russet potatoes or 5 – 6 white potatoes for this recipe. Red, yellow or blue varieties may be smaller and require even more. Just eye ball how many you think you will need to cover the meat mixture in your 2-quart baking dish, about 3/4″ – 1” thick. 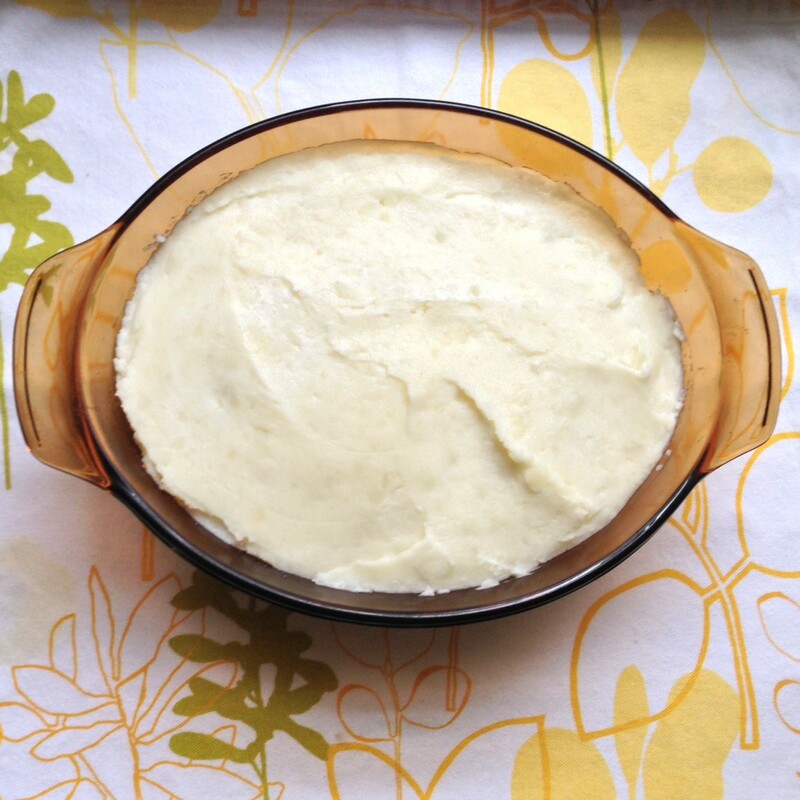 If you’re lucky, there might even be some cheesy mashed potato left over to nibble on later! While your potatoes are boiling, wash half a pound of white mushrooms and cut them into 1/8” thick slices. 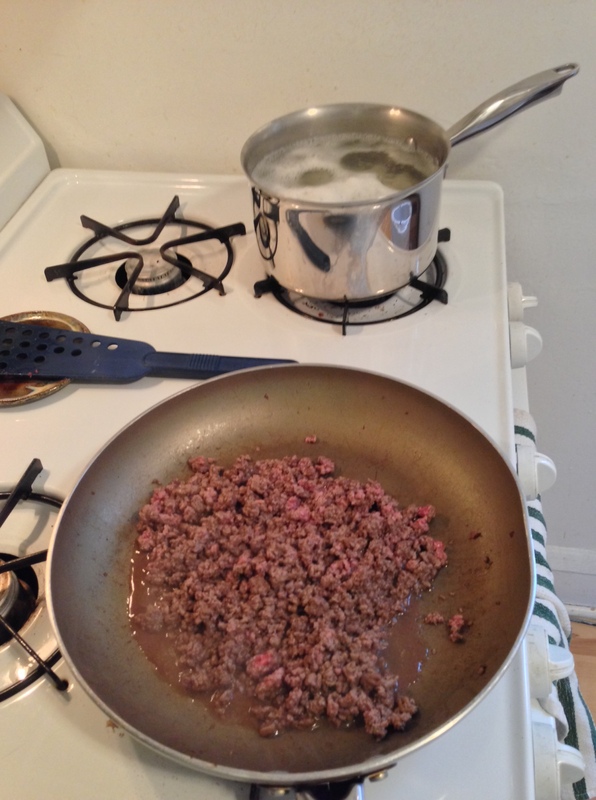 Start browning your ground beef in a non-stick skillet while you chop one cup of onion and mince your garlic. The original recipe calls for 1 minced garlic clove but I use 3 or 4 cloves because I LOVE garlic! Don’t forget to check your potatoes. Cooking time will depend on the size of your cubes. You can turn them off after a fork or knife slides into them with no resistance. Once your beef is browned, use a slotted spoon to remove it from your skillet and set it aside. 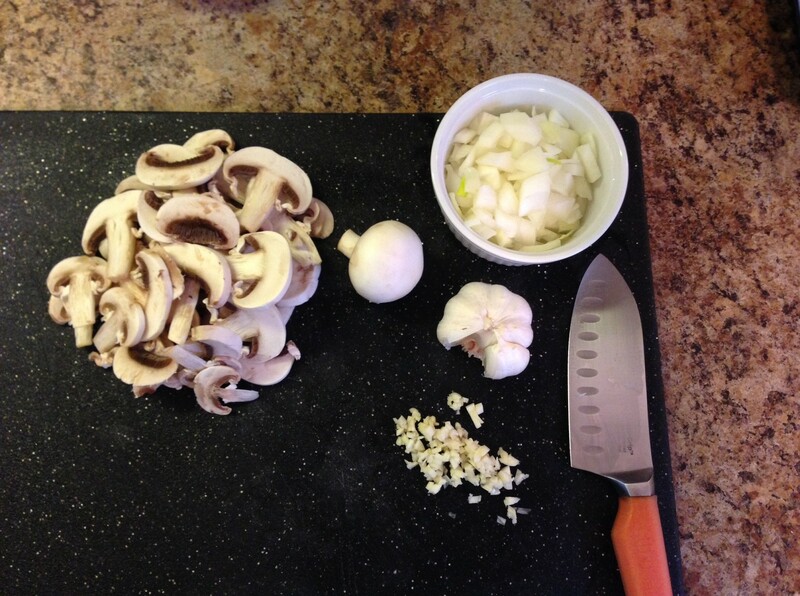 Use 2 tablespoons of the drippings to sauté your mushrooms, onions, and garlic. 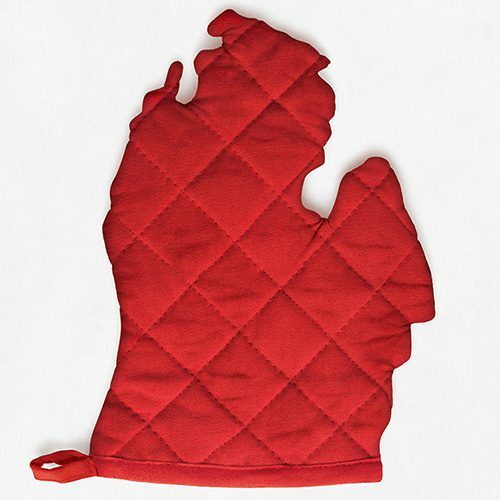 Cook until tender. 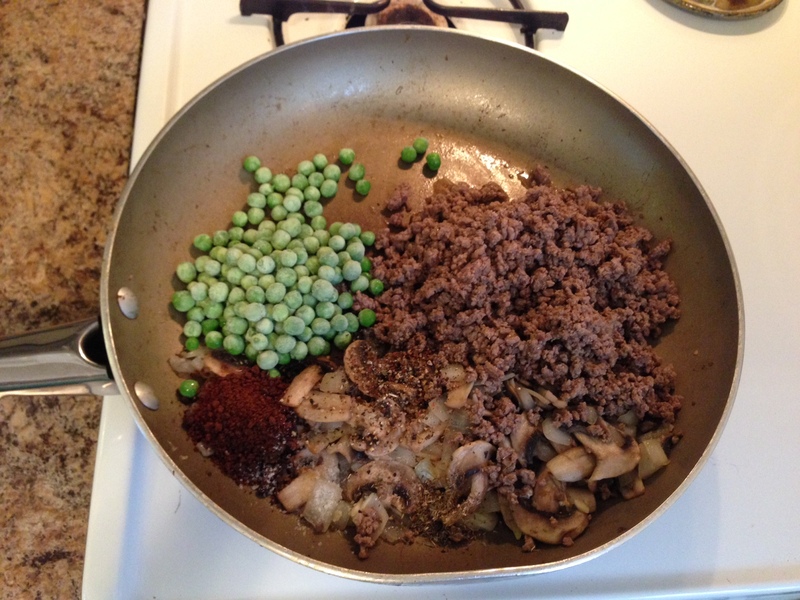 Add the beef back into your skillet with the veggies along with 1 cup of frozen peas, 4 teaspoons beef bouillon granules, ½ teaspoon salt, ½ teaspoon dried thyme, and ¼ teaspoon (or more) freshly ground pepper. Stir to combine. Sprinkle 1 tablespoon of flour over the meat mixture and increase your heat to medium-high. Cook, stirring constantly for one minute. 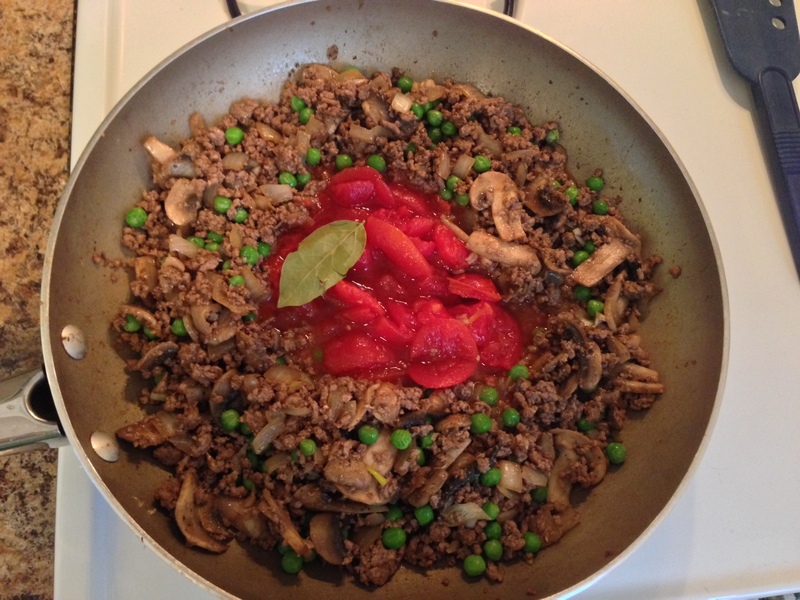 Next, stir in 1 14-ounce can of stewed tomatoes, 1 bay leaf and 2 tablespoons of red wine vinegar. Reduce the heat to medium. Using a wooden spoon or spatula, break up the large tomato pieces. Cook for about 3 minutes or until slightly thickened, stirring frequently. Remove the bay leaf and transfer the meat mixture to a 2-quart baking dish. **It’s not the end of the world if you forget to remove the bay leaf. When my husband, Evan, was growing up, his dad always said finding the bay leaf on your plate was good luck! Are your potatoes done? Drain them and return to your sauce pan. Add 1/4 – 1/2 cup of sour cream, a handful of shredded mozzarella cheese, and just enough milk to make the mashed potatoes smooth and creamy. I also like to add a bit of shredded sharp cheddar cheese. I find that it gives them a little bit of additional flavor and a slight golden color. 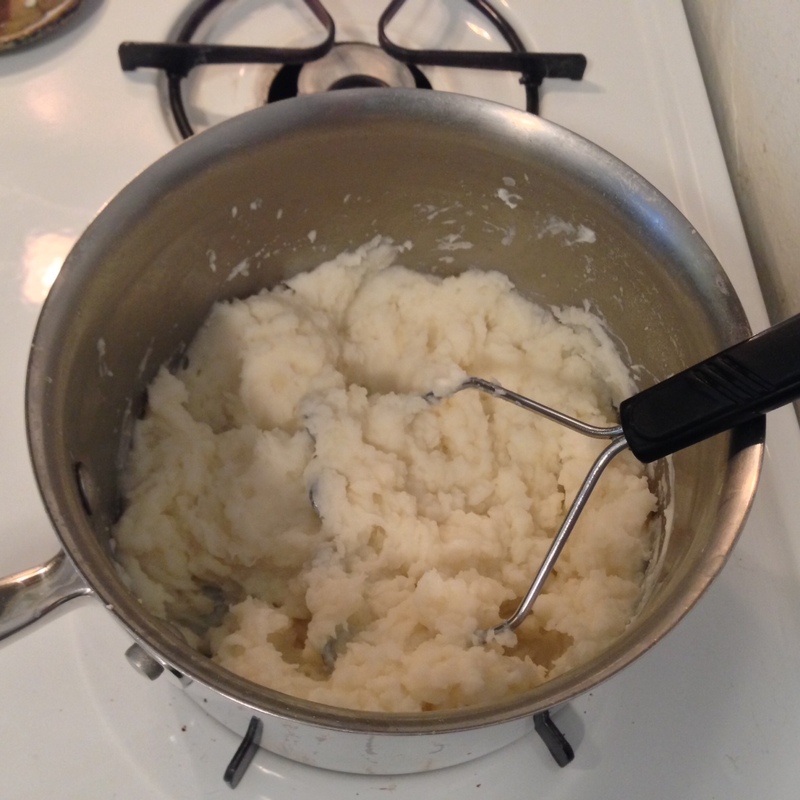 Mash your potatoes until smooth. The rest is easy! 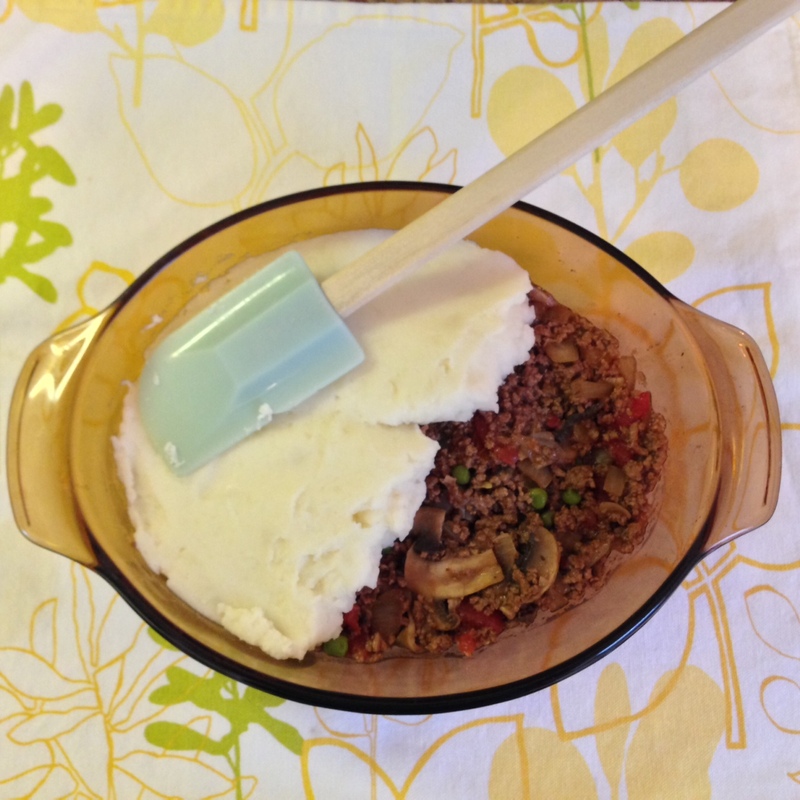 Spoon your potatoes over the meat mixture, using the back of a spoon or a spatula to create an even top. Bake until hot and bubbly, with the potato topping starting to brown just a bit. Let it cool for five minutes and then serve with your favorite side dish. ENJOY! 2) Peel and cube your potatoes. Place them in a large sauce pan filled with water and boil until tender. 3) While your potatoes are cooking, wash and slice your mushrooms. 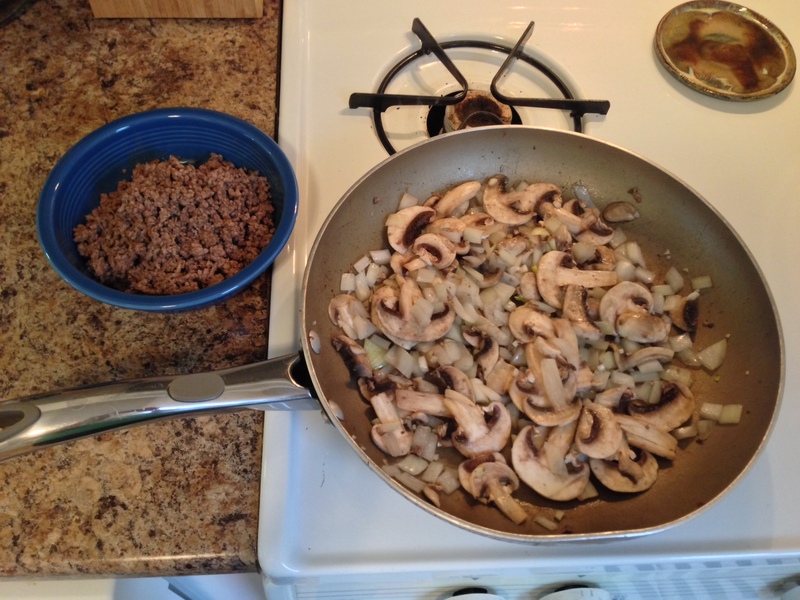 Brown your ground beef in a non-stick skillet. Chop one cup of onion and mince your garlic. 4) Remove the browned beef with a slotted spoon, transferring to a dish and set aside. 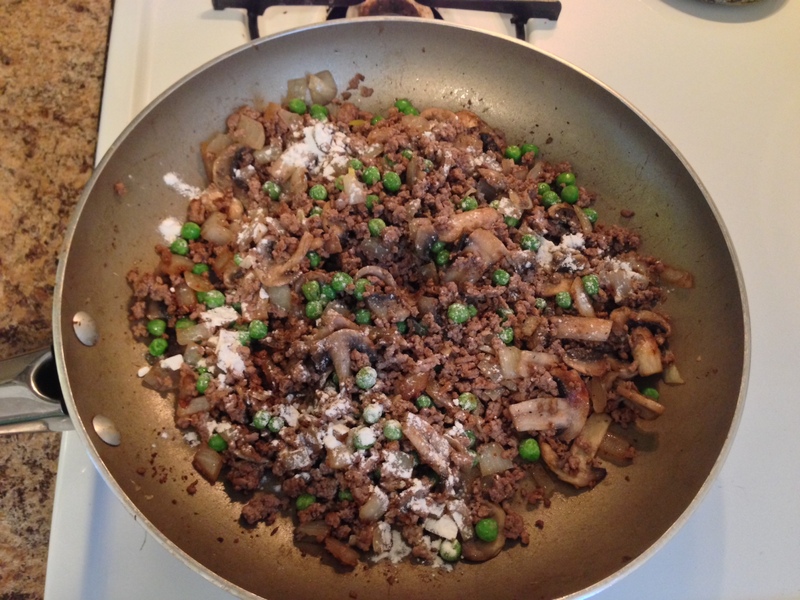 Use 2 tablespoons of the beef drippings to sauté the mushrooms, onion, and garlic until tender. Add the beef, peas, beef bouillon granules, salt, dried thyme, and black pepper. Increase your heat to medium-high, sprinkle flour over the meat mixture and cook, stirring constantly, for one minute. 5) Add the stewed tomatoes, bay leaf and vinegar, breaking up the large tomato pieces with a large spoon or spatula. Reduce heat to medium and cook for 3 minutes or until slightly thickened, stirring often. Remove the bay leaf. 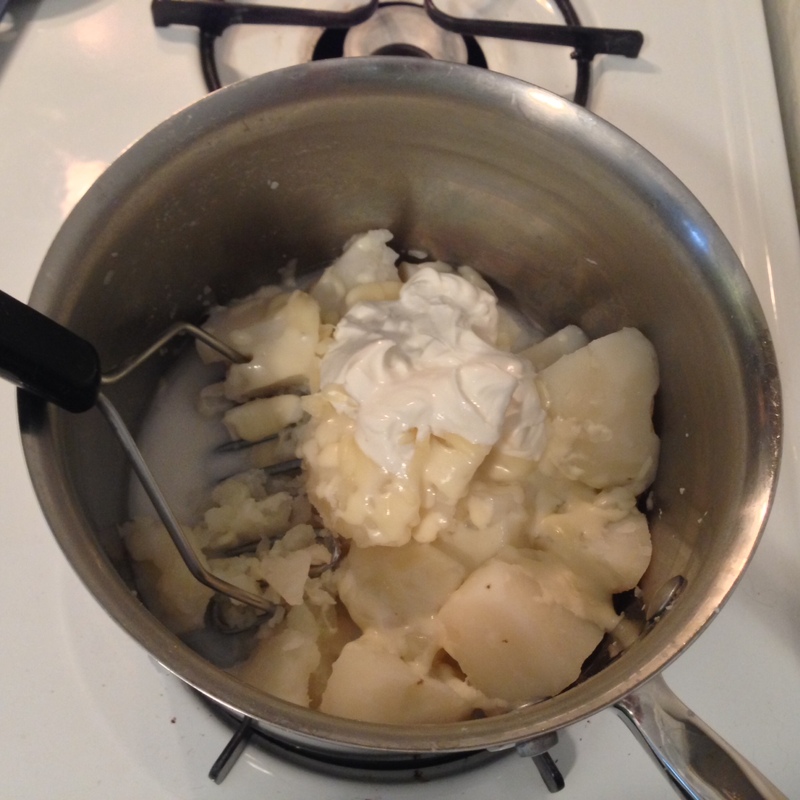 6) Drain and mash the potatoes with sour cream, shredded cheese, and milk until smooth. 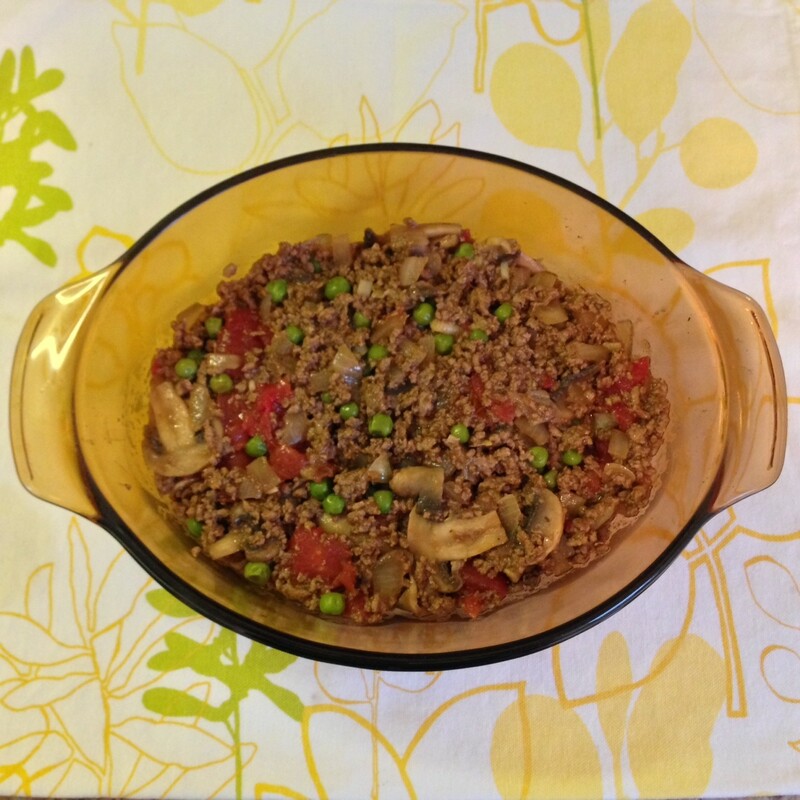 Spoon over the meat mixture, smoothing it with your spoon or spatula. 7) Bake at 400 degrees for 20 minutes or until thoroughly heated. Let stand for 5 minutes before serving. I do something similar and my people love it…..No on the Mozzarella but,a big yes on the cheddar cheese in the mash potatoes… 🙂 Keep those recipes coming Marta!! I love reading your blog and find myself constantly checking for the next delicious sinful dish you post!